Family Friendly...Convenient access to beach with a Private Path. Great for young families...you don't cross over or walk on street to go onto beach. Close to restaurants, shopping, amusements, golf, recreation. * 4 Bedrooms, 3 1/2 Baths. 2 Bedrooms on 1st floor and 2 Bedrooms on 3rd floor. 3 Bedrooms have their own deck. * This townhome is located in the ocean block of Dagsworthy Avenue, just off the sand. Delaware beach living at its best. Private access to beach. Full Size Washer and Dryer Fully Stocked Kitchen. 2 Coffer Makers-Drip and Keurig 50 inch ROKU TV in Living room with Cable to watch your favorite TV and Netflix. TV also in 3 of the 4 bedrooms. Outside shower. Central location for walking to restaurants. 50 Inch Smart TV. L shaped sofa with Coffee Table. Dining Room-Table with 6 chairs. 3 stools at kitchen counter. Seating at table on deck for 4. Free WiFi Access Master BR w/ King size bed and Full Bath. TV w/DVD. Deck with Ocean view and Beach view-3rd Floor 2nd BR w/ Queen bed and Full Bath-3rd Floor 3rd BR w/ Queen bed w/TV/DVD-1st Floor 4th BR w/2 twin beds Living Room w/TV and DVD, Stereo w/CD player...Deck with Ocean and Beach view-2nd Floor TWO private parking spaces just 1 step from entry Phone, Central Air Conditioning, Cable TV, DVD, VCR, Stereo, CD Player Full Kitchen with all you need-Utensils...pots and pans...etc, Breakfast Bar, Microwave, Dishwasher, Refrigerator, Ice Maker, Coffee Maker. Outdoor Charcoal Grill (BBQ) Washer, Dryer, Outside Shower, Fireplace No smoking, no pets Jolly Trolly, just 1/2 block away from taking you on a leisurely ride to Rehoboth Beach. Lovely property and exceptionally well stocked kitchen! Great proximity to all the places we wanted to go and Jeff was amazing! So easy to contact and always for right back to me with answers to any questions I had!! Plenty of space for everyone and we could sit on the balcony and listen to the ocean in the morning! The owner is very accommodating and the location is fantastic! A short walk to the beach and walking distance to restaurants. Everyone had their private space, and we gathered for meals in the open kitchen and living room! We had a wonderful week at this 3 level, FULLY equipped condo which is so close to the beach you have a private access path. The kitchen has more in it than I do in my own home. The view of the "O-sun" as our toddler called it was perfect and she greeted it each morning with a wave and "Hi, O-Sun!" Our group was the ladies of one family; ages 3 months, 22 months and all the way up to 60+. Everyone had a wonderful week. The owner responded quickly to questions before we went and made it clear that he was available anytime by phone or email. We did not need to contact him during our stay because there was nothing wrong! We would be happy to stay here again. Was bigger than the pictures made it out to be! Clean, within walking distance to everything and close to beach! Kitchen well stocked too. If opportunity arises again we will definitely stay here again! Great townhouse to rent!! We rented for a week stay 9/2/2017 to 9/9/2017. 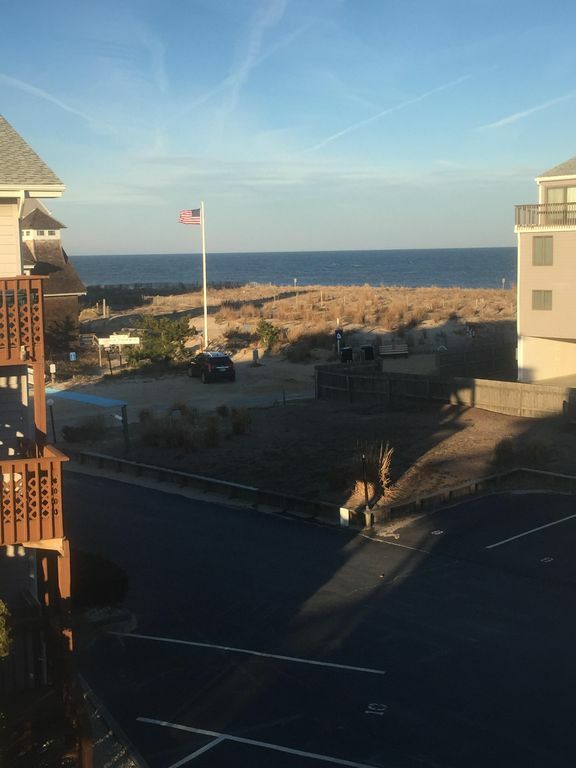 The townhouse was everything we were looking for in a rental in Dewey Beach. The view of the ocean from the balconies were great. The location is very convenient, just a few minute walk to the beach, numerous great restaurants and bars a short walk away. The owners Jeff & Jennifer where great to work with, any question I had they were more than happy to respond quickly. They were even gracious enough to mail me some items that were left behind after our stay. Our "group" has rented many places in Dewey beach over the years and we will definitely be looking to rent this townhouse again. We had a wonderful time despite the weather not being totally cooperative. Grandchildren didn't seem to notice. Ocean was raging but love to watch it and kids thought it was great. One thing about Dewey is you always have the bay to fall back on so that was an option along with paddle boarding. Third year staying in Dewey with family and third rental, all different, all with pluses and minuses, but overall a wonderful vacation.